There are 147 videos on my YouTube channel, and as you would expect - some are watched more than others. The top seven lifetime details below show that my "How To... Create a Basic Gantt Chart in Excel" remains the outright leader as it has done since it was published on 4th January 2010. It alone accounts for 10% of all views. Fast catching up on it though is my "How To... Plot Multiple Data Sets on the Same Chart in Excel". It is my most popular video over the past year, and is a surprise "hit" for me as I remember putting it together very quickly and only after I had tried to do the same thing myself. 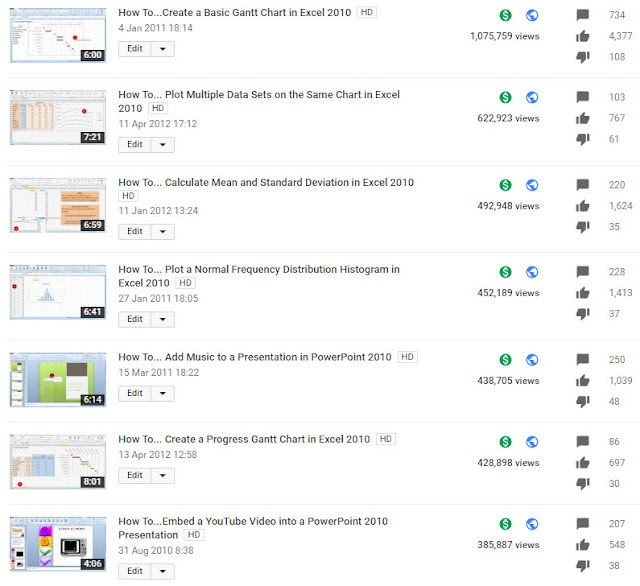 The top three videos below make up 20% of all views - these are the ones that also make me the most money. Not shown here, but at the bottom of the list are my SPSS videos. While these are still very new and will take time to gather views, it is also a fact that far fewer people use SPSS compared to Excel - so I am not expecting them to surge up the leader board. The number of "Likes" and Comments is also gratifying - more about this tomorrow.